Happy Friday everyone! Now that Thanksgiving is over I think I'm all set with eating for the rest of the year. JK, there is still the rest of the holidays to get through. I'll be rolling around my apartment by the time the eating parade is over. 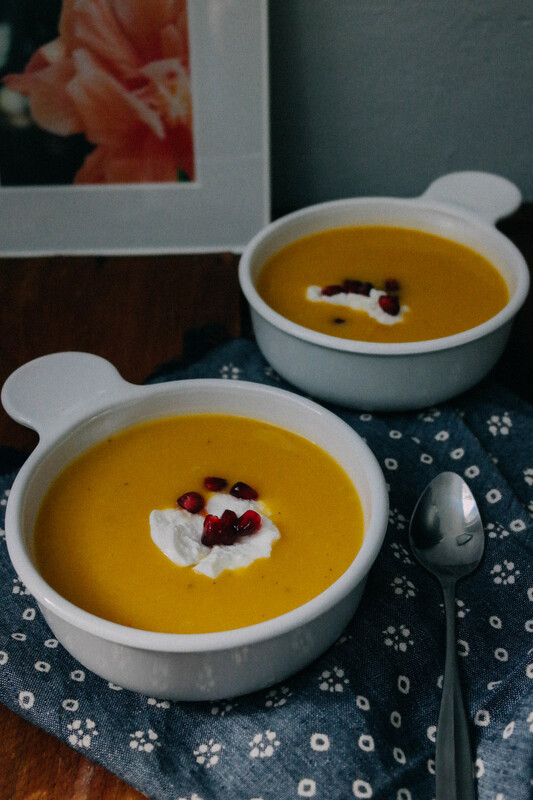 That being said, I wanted to share a recipe for delicious and super easy butternut squash soup - one of my all time favorites - served with ricotta and pomegranate seeds. Heat oil in a large soup pot and add diced celery and onion. Cook until vegetables have begun to soften and onion turns translucent. Stir in butternut squash, thyme, chicken broth, salt and pepper. Bring to a boil, reduce heat and simmer until squash is fork-tender, about 30 minutes. Pour soup into bowls and add ricotta and pomegranate seeds. Thanksgiving is one of my favorite holidays, not just because of the food. I feel like it's one of the only days where my whole family gets together and just focuses on us, no gifts involved. It felt particularly meaningful this year, given all that's been going on in the world. Although I normally don't discuss "worldly" issues on this blog, I have been paying attention every day to the tragedies happening around the world - in Paris, Lebanon, Mali, Brussels, and countless other places. I spend most of my days going back and forth between my job, publishing, being with friends, and baking, but lately I've had anxiety about the world being such a scary place. I traveled to Belgium last year, and was also there, and Paris, while studying abroad and it hurts my heart to think about such beautiful countries having so much horror. It also makes me afraid for the world that my kids (if I have kids) will live in growing up. It seems like everyone on this planet could use an opportunity to reflect on making the world a better place.